Entering into a storage auction may lead to some interesting and lucrative items, that’s the whole purpose we go into it. But every so often, there are such valuable hauls discovered that you wonder how they came to be abandoned in this way. This is a well known case of a storage auction find that is truly off the scale. 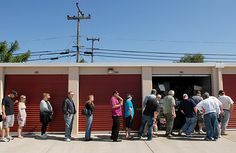 During the filming of Storage Wars television programme, a unit was auctioned off for $1,000 without anybody having much of a clue what was inside. Inside the unit was discovered a box of gold treasure dating from over 200 years ago and that would be expected to fetch half a million dollars. That’s one lucky bidder who is set up nicely for quite a while. These sorts of finds are truly one of a kind and never expected. Something like a treasure haul might be a sparkling find, but you never know what valuables might be lurking in more innocuous areas of a claimed storage bay. One auction winner had found a bay containing a pile of old newspapers, which could easily have been discarded. However upon scrutiny it was discovered that they all dated from 16 August 1977, and all contained news concerning the recent death of Elvis Presley. Due to the incredible collectability of Elvis memorabilia, this unlikely pile of papers went for $90k. It is well known that first editions of many publications are going to sell for more, but in the world of comics this has become greatly exaggerated. A storage auction win in 2011 unearthed an original copy of the very first Action Comics edition originating from 1938 and featuring the first appearance of Superman, thus beginning the action hero genre as we know it today. Being in mint condition, the comic went for an astonishing $2 million when sold at auction – that’s four times more than the pirate treasure we saw earlier above! The storage unit of a deceased artist was cleared out by a removal company, on the assumption that nothing of value had been kept. When they came to give the items a proper examination later, a container of ancient artefacts from the Mayan era was discovered, with monetary value in the thousands, and historical value even more considerable. So just think next door to your boxes of papers and cupboards, there might be all sorts of valuable and unique items encased in the same warehouse unit as yours. This stands as testimony to the reliability of self storage as a medium for keeping precious valuables. And whilst many storage auctions might only come up with a few interesting things of note to secure the profit margin, there are once in a lifetime freak occurrences that might occur, but only if you get involved. Contact the storage company near you to enquire about their auction days.